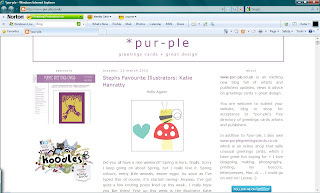 I am very happy to say that I have been blogged about on *pur-ple greeting cards and design blog! The lovely StephSaysHello has been posting about her favourite artists and has choosen to mention me, please check out the blog and steph's work. I have been a fan of her work on flickr for a while and she designs some brilliant cards and characters!